News and releases of Beats will be posted here. The long promised .dwi support is finally here and complete (as far as my testing has gone at least). SM->osu! 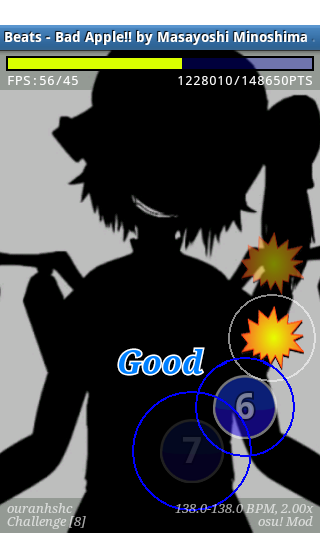 Mod has been done back in 1.5b, but now real .osu files can be used as input with osu!->SM pretty much complete (sliders and spinners aren't yet added though and direct beatmap downloading support from http://osu.ppy.sh will require some peppy poking). High scores are saved locally per stepfile and difficulty level, and screenshots can be taken by pausing the game while having the Screenshot Mode setting enabled. As well, thanks to the hard work of all the volunteer translators at crowdin, Beats is now officially available in 12 different languages (but of course, you can make that grow)! 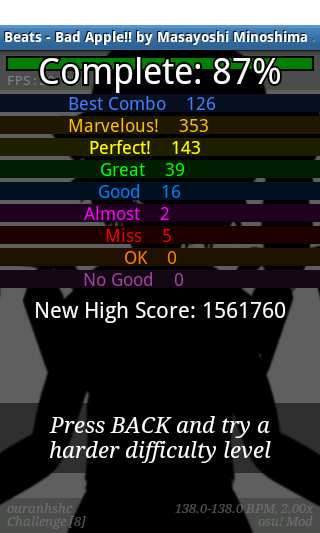 Bad Apple - high score! Whats next? If you haven't heard already, I am planning on doing a COMPLETE REWRITE of Beats over the summer/fall, tentatively called Beats2. Not only will it be OPEN SOURCE (modified BSD license) and rewritten with many of the wanted features on the ToDo list but it will be designed with customization and game mode flexibility in mind. New to the rhythm game scene and only know Guitar Hero? Beats2 will have it - guitar mode. Old-school and just want to Beatmania IIDX it up? No problem - beats mode. Prefer imported games? Lucky for you, I'm a fan of Project Diva and Jubeat! A side/parallel project that I'm very interested in is attempting my hands at an actual rhythm analyzer library for helping generate stepfiles directly from music in your library (think DancingMonkey, cept for more than just StepMania). Beats2 is a distant long-term project at the moment, so what about Beats? Following Beats 1.6b, I will probably be experimenting with adding various features here and there listed in the "Experimenting with Beats 1.7b" section of the ToDo list. High score is a very nice touch. Felt that it is more stable than before. Which is awesome. Will be trying out the .osu files when I have the time.